A few weeks ago, a number of articles came out in various publications (such as the Washington Post, Bloomberg, and the Atlantic) talking about a potential cacao shortage. Even once the International Cocoa Organization and Barry Callebaut released statements saying that this concern was overblown (and there really wasn’t anything to worry about) I still thought it would be interesting to explore the state of cacao, and answer a few good questions that these stories bring to mind. To begin, all cacao is not equal. Most of the world’s cacao is divided into the categories of bulk cacao and fine flavor cacao. Bulk cacao is a commodity, this means that it is typically considered interchangeable and is generally used for its cocoa butter and bulk mass, not for the flavors it provides. Fine flavor cacao is sought out for its specific, unique flavor which means it is anything but interchangeable. My understanding is that industrial chocolate makers use a combination of bulk and fine flavor cacao to make their products (although I’ve never made chocolate on an industrial scale so its second-hand knowledge). Craft chocolate makers, on the other hand, use only fine flavor cacao. In Punta Gorda, Belize, Maya Mountain Cacao is working to connect farmers of fine flavor cacao with specialty chocolate makers like us. 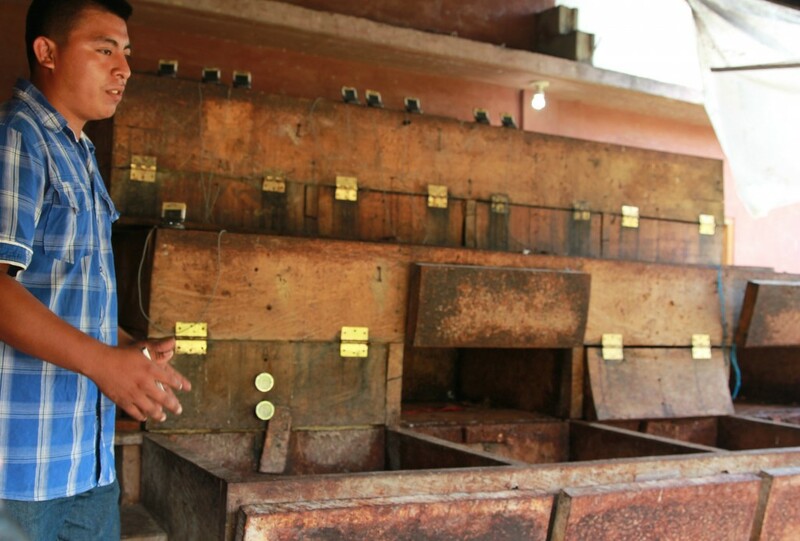 Samuel Tzui, above, carefully monitors the fermentation process. All of the articles about a shortage were, albeit not explicitly, talking about bulk cacao. So let’s dive into that. While there has been talk of a potentially large deficit of bulk cacao, the best way to understand the data is via the International Cocoa Organization. They monitor both production and “grindings” (which is basically shorthand for describing the amount of cacao used rather than stored). The ICCO produces an annual report that shows what’s been happening over the course of the year, and it’s available free of charge! If you are interested in understanding the current cacao supply and demand, this is a great resource. As for deficit and surplus, well, over the last 10 years there have been 5 years of deficit and 5 years of surplus. While demand for chocolate has been growing, so has the supply, at approximately the same rate. When someone refers to a shortage of cacao they mean the demand will outstrip the supply, fortunately the numbers don’t show we need to be concerned about that for at least the next few years. A few of the articles also mentioned Genetically Modified (GMO) cacao. To our knowledge, there isn’t currently any GMO cacao in large scale production. That doesn’t mean someone somewhere isn’t splicing some cacao genes in a lab, but so far we haven’t heard anything about it. That being said, there is a lot of hybridization going on in the cacao world. Research stations all over the world are combining varietals to select for the most desired characteristics. The interesting part is that it all depends on your goal; some people want flavor, some want volume, and some want disease resistance. The frequently-mentioned CCN51 is a result of cross-breeding, and as many of these articles have mentioned, it does a great job of producing large quantity of beans although they are pretty unpalatable. This doesn’t imply that cross-breeding always results in a bad flavor, there are some really tasty varietals made in nurseries! We don’t buy bulk cacao because it won’t provide the flavor we need to make 2 ingredient chocolate, this means the price we pay is not based on the commodity price. When we purchase cacao, we pay a price based on its value, which depends on the quality of flavor to the work the organization producing the cacao is doing. So, as producers improve their product, they are able to get better prices. The prices we’ve paid vary from $4.40/kg to $7.60/kg. Now to the heart of the matter, bulk pricing! 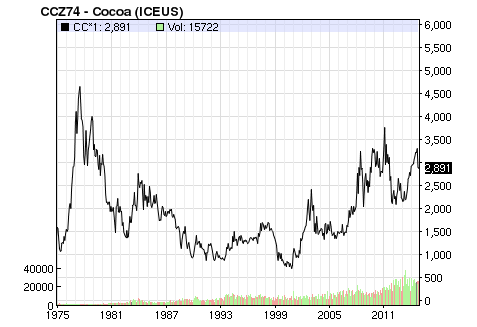 In contrast to fine flavor cacao, commodity prices tend to rely on supply and demand. The larger the supply in comparison to the demand, the lower the price, and vice versa. Because cacao takes between 3-5 years to become productive this does mean that there is some lag between market prices and production, but looking at the world price over the last 40 years, you can see that there has certainly been a periodicity to it. The implication is that if there ever was a huge deficit of cacao, the price would increase and then people would start to produce more and the cycle would go on, there doesn’t seem to be any data showing this cycle will not continue, or that it would ever result in a lasting shortage. As long as we are talking about pricing, it might be worth noting that 40 years ago the world price for cacao floated around $1500/metric ton. The price is currently around $2800/metric ton (see above graph for reference). While there has been a lot of fluctuation in between, that $1500 US Dollars in 1974 is worth about $7,224.13 today. (based on the US Bureau of Labor Statistics inflation calculator) In other words, the price of cacao has not been keeping up with inflation (at least over the relatively arbitrary time frame chosen). This is a big part of why working with cacao producers directly is sustainable, ensuring that chocolate makers can get a higher quality product and the cacao producers can get a better price for their products. It’s a win-win, and good protection for everyone against the market’s volatility. I’m glad these articles brought up some useful topics to discuss, cacao has a long history and we are still new to the industry, but digging into the data more deeply is always an exciting way of turning up more information about the state of things. As always, we are happy to answer any questions you might have for which we have an answer! ← Bi-Rite Toy Drive Next Tuesday! Hello, I was in San Francisco last weekend and popped into your store and had the BEST chocolate I’ve ever had when I bought some nibs toffee (I think that’s what you called it) and just went online hoping to be able to order some to be delivered to my home in San Diego but didn’t see it. Is there a way to get some??? Have you tried sourcing beans in the Philippines? There are many producers of cacao beans in the Mindanao area (I’m one of them with over 5 thousand trees of the 3 varieties) and since you’re in SF, having cacao beans directly imported from the philippines could be a very good marketing for many Filipino clients around the area.